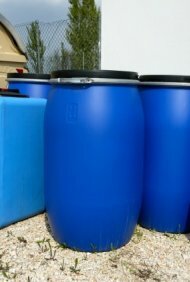 Plastic 55 gallon drums made out of recycled plastic can be used for collecting rainwater.They make ideal rainbarrels. The 55 gallon drums seen in the picture are food grade barrels,they make ideal rain barrels. Other standard size rainbarrels can be found in sizes ranging from 60 to 80 gallons. Weather you decide to go with the standard 55 gallon rain barrel or the 80 gallon, there's a few things to keep in mind when choosing your plastic rain barrel. When collecting rainwater, place your rainbarrel under a gutter that has shade. You don't want any direct sunlight on the plastic barrel. The other choice you have is to use paint for plastic to protect your plastic barrel for years to come. You may also not like the plain old solid color of the barrel. Painting it will give it a bit of flair, life and just let it blend in as much as possible with your garden. Advantages of using a plastic rain barrel is that it won't rot, it's easy to clean,and you can use a product like armour all to protect the plastic from the sun's harmful UV rays.